If you haven't already heard, ROG is coming to BlizzCon® 2017 and the ROG team is giving away some high-end prizes. For your chance to win, all you need to do is stop by the ROG vending machines in Hall C, take a survey, or post a photo of the booth on social media and you'll receive a special-edition BlizzCon 2017 collectible coin. If you're lucky, you might also receive a rare Golden Ticket that immediately qualifies you to receive a Gold Level prize, but you can also choose to power-up to the Ultimate Level prize. 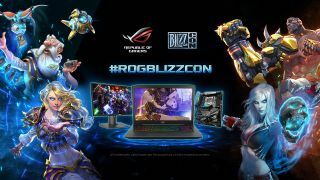 To unlock the Ultimate Level prizes, use the #ROGPOWERUP tag to find other Golden Ticket-winning BlizzCon attendees and return to the booth to earn either a ROG STRIX GL503 gaming laptop, ROG STRIX X299-E gaming motherboard, or ROG SWIFT PG248Q gaming monitor. Stop by the BlizzCon vending machines in Hall C of the Anaheim Convention Center on November 3rd and 4th for your chance to win! See you at BlizzCon 2017!